Bring a little bundle of joy into your home -- feline style. 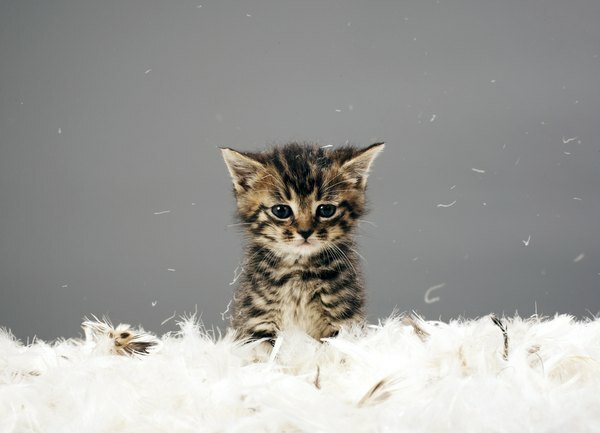 The sight of tiny, fluffy and clumsy little kittens can make nearly anyone feel a little soft inside, from the most hardened John Wayne type to a hyper child. Add a little softness and love to your life for years to come by bringing a kitten into your home. Although many benefits are associated with adopting older cats, young kittens have their advantages too. Cats, like many creatures, can be stubborn animals. The younger a cat is when she comes to your life, the easier she will be to train and socialize, whether it comes to using the litter box or giving and receiving affection. This is especially relevant if you plan to take in a cat from a feral or stray outdoor situation, as these cats often have reverted to their "wild" instinctive ways. Although it may seem to some like quite a fanciful notion, the presence of a sweet kitten can do wonders for your health! Having a cat in your life can be beneficial for your physical health and emotional well-being, from lowering your blood pressure and cholesterol to easing pressing feelings of anxiety, stress, depression and loneliness. If you have small children, bringing a kitten into your home may be a fun way for your little ones to learn a little bit about the daily responsibility of pet ownership. Although kittens do not require the same upkeep as dogs, a lot of maintenance and care is still the name of the game, from cleaning out the litter box to making sure kitty is properly fed at all times! Believe it or not, having a kitten can also be of great help to your social life. Talking about caring for a cat can help you establish connections with other pet owners in your neighborhood. Not to mention, meeting like-minded individuals in the cat-food aisle of your local supermarket or drugstore can be an exciting way to connect with other animal-loving members of your community. When Can a Kitten Be Taken Off a Formula?